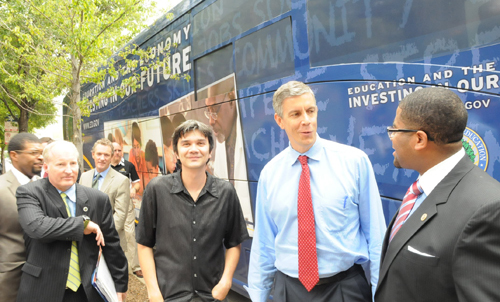 U.S. Secretary of Education Arne Duncan (above, second from right) began his career promoting segregation and re-segregation while he served as Mayor Richard M. Daley's handpicked "Chief Executive Officer" for Chicago's public schools, from July 2001 through December 2008. He continued his promotion of white supremacy in public schools throughout the years when he was firing black teachers in Chicago and reorganizing black schools under "Renaissance 2010," which replaced hundreds of veteran black teachers with novices from outfits like AUSL and Teach for America. As early as August 2001, Duncan became angry at Substance when Substance noted, in response to a Duncan speech to the City Club of Chicago, that Duncan's "choice" mantras were promoting segregation. Duncan's policies in support of segregation continue as he serves as U.S. Secretary of Education under America's first black President. Substance photo by George N. Schmidt.Prior to passage of the Elementary and Secondary Act (ESEA) in 1965, a savvy Lyndon Johnson, who knew the South would never willingly desegregate schools, crafted the federal legislation so that large sums of money would go to any of the segregated systems of the South that would comply with the Civil Rights Act of 1964, which, of course, banned racial discrimination in any public institution receiving federal funds. This strategy of carrot (ESEA) following stick (Civil Rights Act) worked like a charm, and the “segregation now, segregation forever” crowd quietly resolved to accept the federal millions and, in doing so, reluctantly complied with the Supreme Court’s mandate handed down in the unanimous 1954 Brown decision, which had been largely ignored in the South. I was a sophomore in one of those small segregated Southern high schools in 1965, and I remember the first black kids who, until that time, had had a 60-mile roundtrip daily bus ride to endure if they wanted to go to high school. As a legacy of that ESEA carrot, then, my little school and the rest of the schools in the Old Confederacy became and remain less segregated than many schools in the North, where housing patterns maintain de facto segregation even where the law cannot. By the early 1970s, apartheid schooling in the 19 Southern states was over, or so we thought. Johnson’s creative use of federal funding, then, was able to accomplish for the commonweal what federal mandates and court rulings could not. Congress amended ESEA in 1966 and 1967 to provide big carrots, too, for special education and English language learners. Major reauthorizations of ESEA followed in 1981, 1994, and in 2001 with No Child Left Behind, with the power of the federal purse strings made more figural in each subsequent reauthorization. Then, following the 2008 calamity brought on by Wall Street’s casino capitalists, Education Secretary Arne Duncan used a newfound power of $4.35 billion in federal discretionary Race to the Top (RttT) grants to sidestep the legislative gridlock holding up changes to NCLB that were being advanced by the corporate foundations and the Business Roundtable: 1) uncapped expansion of charter schools (minus any regulations or incentives for maintaining diversity or inclusion of special populations or ELL), 2) proliferation of testing data tracking systems, 3) more value-added standardized testing, and 4) teacher evaluations based on student test scores. Any state or LEA that wanted to get a chunk of Duncan’s 4 billion dollar carrot would have to comply with these four conditions. In an ironic twist of policy fate whose impending impact remains as ignored as it is misunderstood by the public, ESEA monies were used, for the first time, as the carrot to re-ignite the policy that the original ESEA had been designed to extinguish: school segregation and poor performance. In peer-reviewed research studies (here, here, and here) that examine the effects of charter schools on school diversity, researchers have found, in fact, that both for-profit charter schools and non-profit charter schools have significant segregative effects when compared to public schools. And study after study after study has shown similar negative effects on school performance as measured by test scores of students in charter schools when compared to matched public schools. No amount of empirical, reality-based evidence, however, can seem to derail or even slow down the charter train, fueled and driven as it is by conservative ideologues, neoliberal efficiency zealots, and the profiteers of the education-industrial complex like Pearson and McGraw-Hill. And now Congress is getting into the act (pun intended) as well, with House passage of H. R. 2218, whose clone is under consideration by the Senate to provide new segregative charter funds, including monies this time for charter school facilities. In these legislative efforts, inspired as they are to break up the ESEA reauthorization into smaller chunks that Team Obama can never claim credit for (or be blamed for, as the case may be), unwitting or uncaring elected officials of our national government are, in fact, promoting the expansion of school resegregation through the expansion of charter schools that, in 4 out of 5 instances, are worse or no better academically than the public schools they are replacing. And neither House nor Senate versions offer a syllable to demand or incentivize the creation of diverse, inclusive charter schools, thus choosing to make ESEA’s most effective social steering mechanism a tool now of segregationists and social control advocates whose agendas appear aligned with the eugenics era that flourished a hundred years ago. If these federal bills in support of corporate reform schooling arrive on the desk of the first African-American President of the United States, will he, too, embrace their silent support of the return to apartheid education? Will Barack Obama show up on the wrong side of history?